Dr George-Jaeggli has a Master of Science degree in Biology from ETH Zuerich in Switzerland, and has been working for the Department of Agriculture and Fisheries (DAF) in Queensland since 1996. She has worked on various projects from yield benefits of windbreaks in wheat cropping systems to applying tissue culture to speed up barley breeding, but since completing a PhD in Crop Physiology has mainly worked on studying complex traits such as plant height, stay-green and photosynthetic capacity in sorghum for their utilisation in yield improvements. Currently, she is working for the University of Queensland as part of the ARC-funded Centre of Excellence in Translational Photosynthesis, and working for DAF on GRDC-funded agronomy projects. The main objective of her previous and current work is to increase crop yields in variable environments, be it through pushing the yield ceiling up genetically or identifying optimal agronomic practices to ensure yield potentials are achieved in growers’ paddocks. 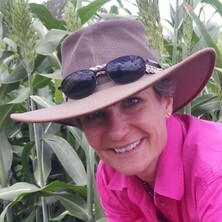 She uses molecular techniques, plant and crop physiological experimentation, proximal and remote sensing and crop modelling to study individual traits at the leaf, plant and crop level. Cereal yields have previously mainly been improved through an increase in harvest index (the ratio of grain to total biomass of a plant). This relationship is approaching a biological limit and further improvements in yield will have to come from increasing the overall growth efficiency of crops, e.g. through improving photosynthesis. Sorghum is a perfect model to study genes that are involved in photosynthetic capacity as it has a relatively simple (and sequenced) genome, but the crop is very diverse. Dr George-Jaeggli is involved in a large research effort combining high-throughput phenotyping methods (including proximal and remote sensing and imaging technologies on mobile platforms and UAVs) and genomics to find genes involved in increased photosynthetic capacity. This work forms part of the efforts of the ARC Centre of Excellence in Translational Photosynthesis to lift crop yields of major food crops to alleviate food shortages. Thanks to public and private investment in sorghum genetics, growers in Australia have access to sorghum, maize and wheat hybrids with great yield potential. Dr George-Jaeggli is part of a team of researchers in Queensland and Northern New South Wales who combine on-farm agronomy trials and crop modelling to provide growers with the tools to match hybrids with optimum agronomic practices for their particular environments to ensure they are reaping the benefits of the improved genetics. The dry-land cereal grain production systems of north-eastern Australia are often affected by water limitation, especially towards the end of the growing season when sub-soil moisture stores run out. Dr George-Jaeggli has been combining molecular genetics, genomics and crop physiological experimentation to dissect complex traits such as stay-green and plant height that are beneficial for yield in water-limited environments. Dr George-Jaeggli's work contributes to the development of new cereal cultivars with greater yield potential, especially in water-limited environments. She has significantly contributed to the unravelling of the mechanisms behind the stay-green trait in sorghum. This knowledge helps to drought-proof crops in Queensland and around the globe and contributes to food security.